I went through what I consider to be a dramatic change in my spiritual life during my college years. There were a number of factors involved in this, including my stage of life, some great mentors, some new ministry opportunities, and a great group of friends. But I want to single out another component that helped to shape me spiritually during that time: I started to read books on theology and listen to sermons from big-name pastors. Three of these pastors/authors in particular had a big impact on me in different ways. First there was John MacArthur. 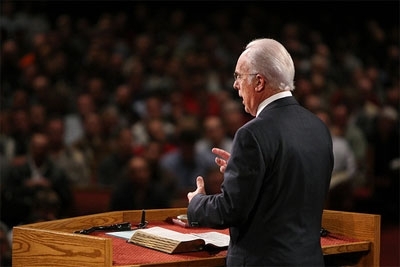 When I first heard John MacArthur preach (via Cassette tape), I was struck by his careful explanation of the Bible. There were no gimmicks, relatively few flourishes, and almost no extra-biblical illustrations. He just walked through each passage a phrase at a time and explained what it meant. And I loved it. I credit MacArthur with teaching me the value of the Scriptures and the endless supply of insight that can be drawn from each passage. 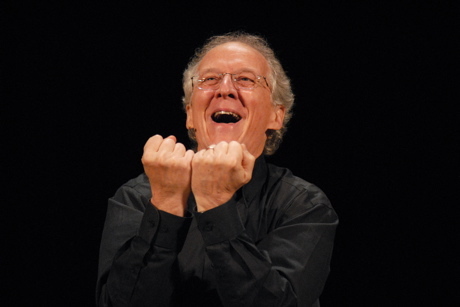 Then I came across John Piper. In addition to being forever changed by Desiring God, I got ahold of his sermon series on Hebrews. In addition to the careful explanation of the Bible that I learned to value through MacArthur, John Piper showed me the importance of following the argument a biblical author uses. Piper would trace the flow of thought in a given passage and in that way show how these seemingly unrelated verses fit together to form a more cohesive (and persuasive) whole. (For my fellow MacArthurites: I know that MacArthur also pays attention to the flow of argument in a passage, I’m merely saying that I noticed this important concept while listening to John Piper.) I can’t overestimate how important this lesson has been in my subsequent study of Scripture. And then I found Francis Chan. Francis has always carefully explained Scripture and followed the logical flow in the passages he preaches. But something about the way he preaches struck a chord in me that I hadn’t experienced previously. It’s difficult to pinpoint exactly why Francis Chan is such a powerful communicator, but for me it comes down to this: he presents obvious, familiar truths in surprisingly fresh ways. He’s the master of the obvious. Francis will often preach on a passage that I’m sure I’ve understood and have been convinced that I’m applying to my life appropriately. But he’ll somehow get me to look at that passage in a new way, to see it with a fresh urgency, and to see that I haven’t truly let it sink into my heart and flow out into my life. Now, there are many other preachers and authors that have had a huge impact on my life. But these three lessons strike me as extremely significant in my own personal development. And thinking about these lessons reminds me that while each of us is different, God uses us for different things. For example, I know MacArthur and Piper preach with passion, but God really used Francis Chan to show me the importance of passion in preaching. We’re all growing all the time, so it’s important to stop on occasion and take stock of where we’ve been and how God has brought us along the way. I’m not a professional preacher, and offering thoughts on “how to be a better preacher” can be dangerous, since I’m yet to “arrive” myself. But my thoughts on preaching do not mean that I know all there is about preaching, nor does it mean that I’m the world’s best preacher. I don’t, and I’m not. But I do enjoy the craft. So here are a few lightly seasoned thoughts on preaching. I’m going to assume the obvious points about having the right character and gifts, praying through your message, depending on the Spirit, and accurately handling the text. These are no brainers. Or, they should be. But once you’re all prayed up and have done your exegesis, how can you hone your message? First, be clear. Clarity is probably the single most important aspect of a sermon. Even if you’re not too passionate, or have nothing fresh to say, or can’t find a super compelling illustration: be clear. I’d take a clear sermon read off a manuscript over a passionate sermon that makes no sense any day. And it has to be clear to others, not you. You are your most unhelpful critic. If you can’t practice on someone else before Sunday, then you’ve got to learn how to think like a stay at home mom, a mechanic, a successful businessperson with an MBA, and a teenage girl who just got pregnant. Put yourselves in the shoes of real people experiencing the joys and sorrows of life. Second, tell stories. You don’t need to pack your sermon full of stories, and your stories don’t have to be long. But people identify with a story much more than they do with abstract truth. And don’t just tell stories, but learn how to be a good storyteller. When you hear someone else tell an effective story, ask yourself: What made it effective? Was it the story? Or the way it was told? (Probably both.) Stories take abstract truth and make it compelling. I don’t care how loud a preacher screams at me, “God loves you! God loves you!” or how many verses he quotes, you may find me snoring in the back row. Tell me God loves me, show me from Scripture where God loves me, and then sweep me up in a compelling story about God’s love that gives fuel to an out-of-gas truth. Third, script your sermons. There are only a few Francis Chans out there who can write some thoughts on a napkin 10 min before he preaches and knock it out of the park (seriously, I wish I were lying). Most of us mortals need some time honing our words, and scripting is a great way to use specific, thoughtful, intentional language to convey God’s truth. Now, if you get up and just read your manuscript, I’ll still be snoring in the back pew. Scripted sermons should not be read on Sunday. They are to be written on Wednesday, edited on Thursday, read 5 times on Friday, and memorized (or close to it) on Saturday. That way, your Sunday sermon may look like it was written on a napkin—hardly glancing down at your notes—but every word has been deliberately thought through, prayed over, and, in case of flat words, deleted. A half-dead truth can be resurrected by describing it with fresh and vivid language. Rarely does such language come into your brain on stage. Fourth, ask for feedback. The best class I ever took in Seminary was a preaching class. Two semester’s worth; it was required. For the class, we preached a sermon every 2 weeks and were ripped to shreds by our classmates and professor. It was great. No, it was terrible and embarrassing—but it was great. “You look like a vulture up there,” stated my unimpressed professor after I preached an entire sermon gripping the pulpit into sawdust. I didn’t even know my hands were on the pulpit! If there’s a preaching rule, I’ve broken it. I’ve smacked my lips, jiggled my keys in my pocket, and chugged water from a crackly 1-liter water bottle. I never knew how abrasive these gestures were until I was told. I’ve used offensive illustrations, made confusing points that I thought were brilliant, and told very dull and ineffective stories that I thought were worthy of publication. Ask for feedback, critical feedback. And you’ll slowly stop making mistakes that can be easily fixed. I’ve got much more to say, but I’ll stop here. We’ll see. If any of this is helpful, I’ll post some more thoughts tomorrow.